Background: Acute myeloid leukemia (AML) is the most common hematological malignancy in adults, characterized by distorted proliferation and development of myeloid cells and their precursors in the bone marrow. Nitidine chloride, a naturally occurring alkaloid, has been identified to possess antitumor activity. However, the effects of nitidine chloride on acute myeloid leukemia cells and its underlying mechanisms have not been elucidated. Here we investigated the cellular and molecular mechanism of the anti-leukemic effects of nitidine chloride. 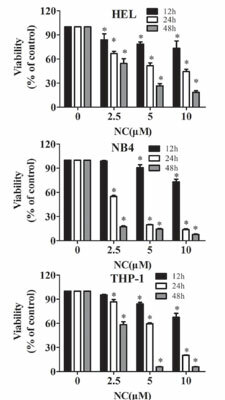 Methods and Results: Nitidine chloride treatment for 48 consecutive hours exhibited a timedependent and dose-dependent growth inhibition activity against AML cells by inducing cell cycle arrest and apoptosis. Moreover, nitidine chloride downregulated Cyclin B1, CDK1 and Bcl-2, upregulated p27 and Bax, inactivated PARP, activated Caspase-3 in AML cells. We further demonstrated that growth inhibition activity of nitidine chloride in AML cells is partially via inhibiting the phosphorylation of AKT and ERK. Conclusion: In conclusion, our data suggest that nitidine chloride could be an effective therapeutic agent against AML via cell cycle arrest and apoptosis. AKT, acute myeloid leukemia, apoptosis, cell cycle, ERK, nitidine chloride.